The Rangers defenseman will be in attendance Wednesday at Mustang Harry's to assist the Jam Kancer in the Kan Foundation. Located just steps from the Garden, Mustang Harry’s is well-known to New York Rangers fans. From 6 to 8 p.m. Wednesday, the midtown watering hole at Seventh Avenue and 29th Street will serve a higher purpose as it hosts an event for the Jam Kancer in the Kan (JKITK) Foundation, which uses the backyard game of KanJam to raise money for kids with cancer. The first 100 fans who purchase $100 tax-deductible tickets can have their photo taken with Blueshirts defenseman Kevin Shattenkirk and enjoy free food and drinks while participating in a silent auction featuring signed Rangers memorabilia, plus chances to win game tickets and other prizes. As part of the festivities, Ian and Niall Conroy, owners of Mustang Harry’s, will also be donating $25,000 to support “Shatty Jam II,” a KanJam tournament featuring Shattenkirk and several of his teammates scheduled for Feb. 9. Those interested can participate in the tournament and raise funds, via Crowdrise, for JKITK, Children’s Hospital of Montefiore and The Garden of Dreams Foundation. Last year’s “Shatty Jam” raised nearly $100,000. Although charitable efforts such as these can put Shattenkirk’s regular job in perspective, the on-ice performance of the Rangers (18-20-7) is obviously always on his mind. 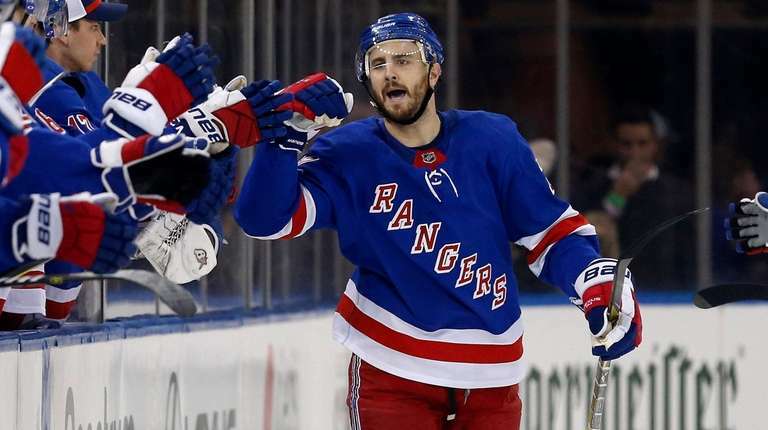 The Blueshirts, who have lost six of seven games since the start of 2019, return to action Tuesday against the Carolina Hurricanes at Madison Square Garden. Tickets for Wednesday’s event can be purchased on Crowdrise, by searching for the “Jam Kancer in the Kan Fundraiser Meet & Greet” and information on “Shatty Jam II” can be found at jamkancerinthekan.com.